Does Water Expand or Contract When Heated? At What Temperature and Pressure Can All Three Phases of Water Exist Simultaneously? What Does Sublimation Mean in Science? Sometimes, it's easy to discern the meaning of words in science because they share some aspect of their meanings with everyday English. Scientific concepts like energy, force and even natural selection are mostly extensions of our common understanding and their colloquial meanings. Not so for sublimation. Even if you know the non-scientific meaning of the word, that knowledge won't help you when it comes to its meaning in science. In science, sublimation has to do with the branch of physics and chemistry called thermodynamics. We're familiar with many phase changes already: melting is the change from a solid to a liquid; boiling is the change from a liquid to a gas; and sublimation is simply the change from a solid to a gas. How does a solid change to a gas? Does it pass through the liquid phase very quickly? Does it transport to some sort of higher dimension? A simple phase diagram shows that the process of sublimation is much less complicated. At certain temperatures (increasing along the x-axis) and pressures (increasing along the y-axis), each substance will exist in either a solid, a liquid or a gas phase. To change a solid to a gas through sublimation without going through melting and boiling, the pressure must be lowered. 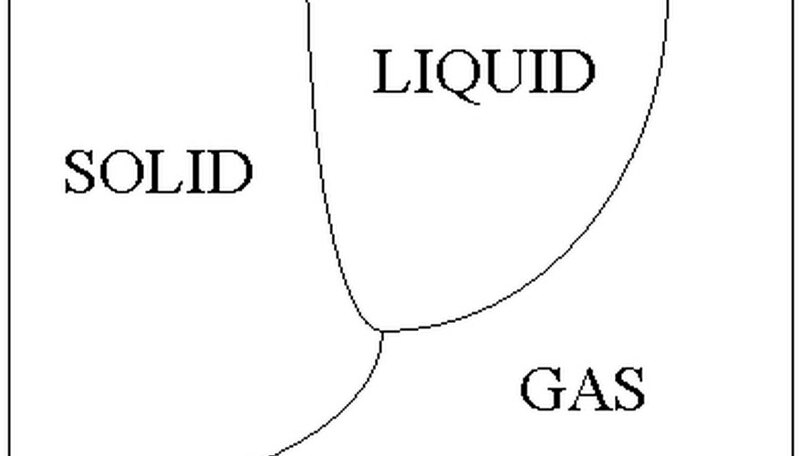 Then it is possible to cross the single line between solid and gas. When you add heat to a solid, the temperature will rise until it reaches a line on the phase diagram. Then, instead of the temperature rising, all the heat is used in changing the phase of the substance. The heat used in that process is called the latent heat of transformation. The heat used to change a substance from a solid to a gas is called the latent heat of sublimation. Heat is absorbed in the change from solid to gas, and (for the same mass of the same substance) the same amount of heat is released in the change back from gas to solid (a process called deposition). Perhaps the most famous example of sublimation is dry ice. Dry ice is solid carbon dioxide which sublimates to gas phase carbon dioxide at room temperature. Iodine can sublime (even though it may also exist as a liquid at room temperature), as can naphthalene, an organic compound used in mothballs. Sublimation is also the principle behind freeze-drying food. What Is Latent Heat Transfer? What Is the Equation for Finding Initial Temperature? Boley, Allison. " What Does Sublimation Mean in Science?" Sciencing, https://sciencing.com/sublimation-mean-science-5398711.html. 24 April 2017. What Phase Changes Are Exothermic & Endothermic?